Taking place on the village church meadow in Kingskerswell, this festival has a really nice chilled relaxed atmosphere. 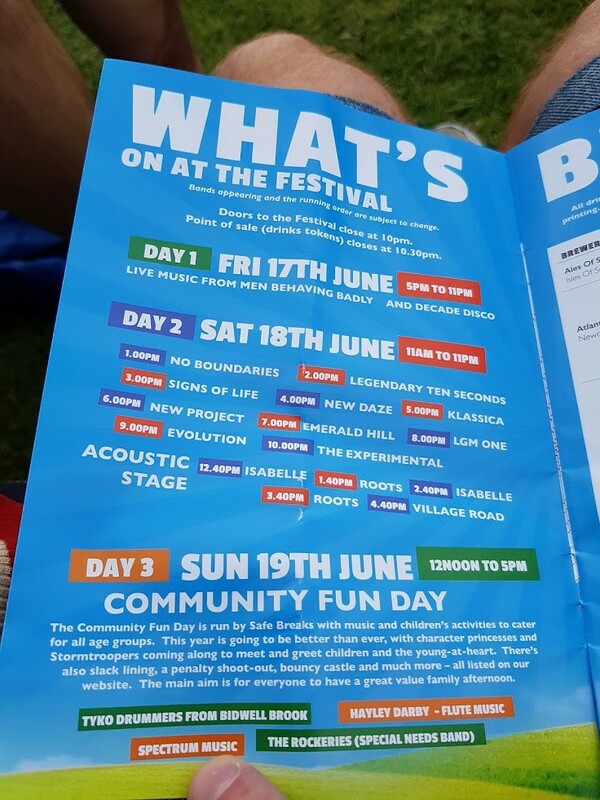 With music from a wide variety of bands (the majority of which are local) and with plenty of beer and activities for the kids, this is a festival for all the family to enjoy. For the last few years there’s been 60+ beers, 20+ Ciders and some wines to keep you quenched throughout the day. 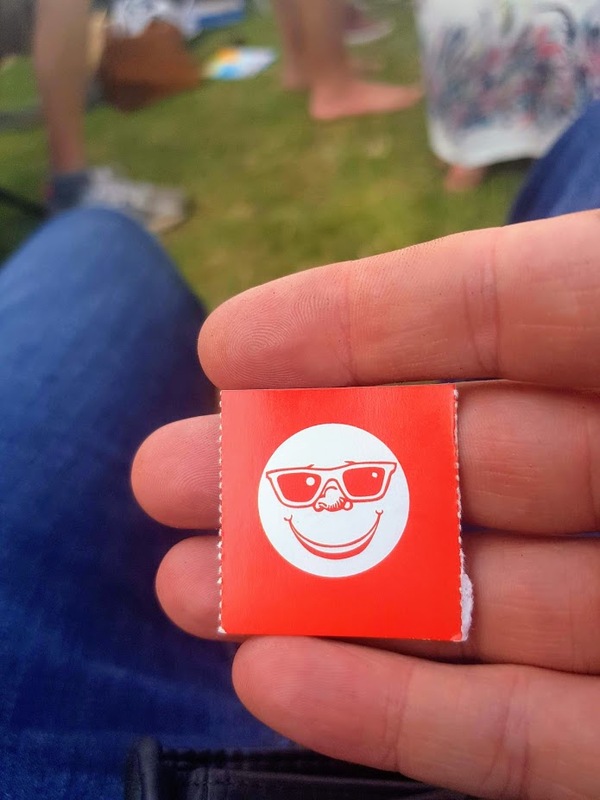 I’ve been coming to the Summer moon festival for many years now and it’s always been a very chilled, family friendly event. 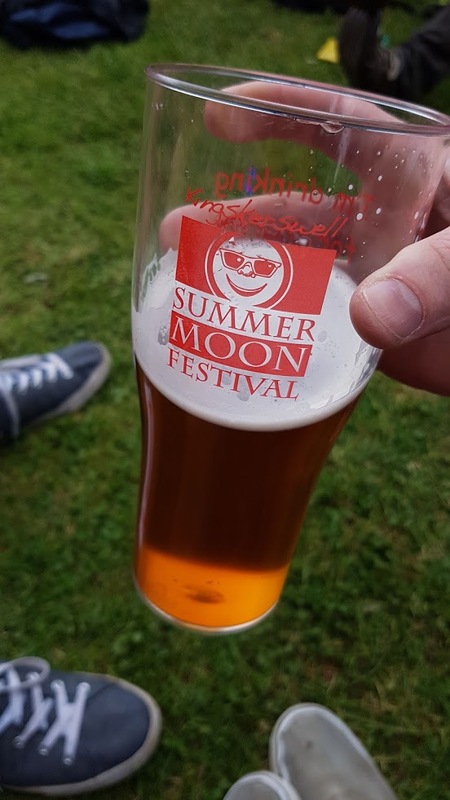 Unlike many festivals around, there is a great selection to choose from even if your not keen on ales. 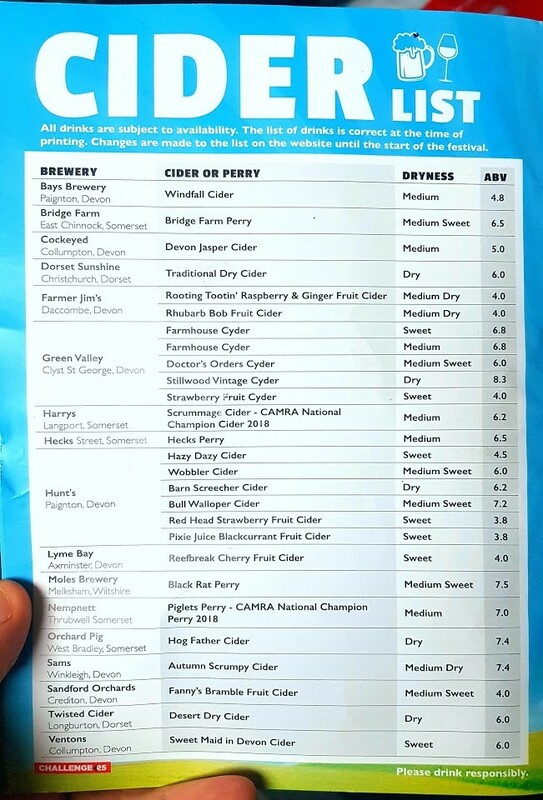 Every year the Cider & Cyder list gets bigger, in 2018 there were almost 30 and for you lovely ladies there is the best wine list I have ever seen at a beer festival with almost 10 on the list, plus the prosecco. Of coarse catering for all tastes they come in sweet, medium or dry. 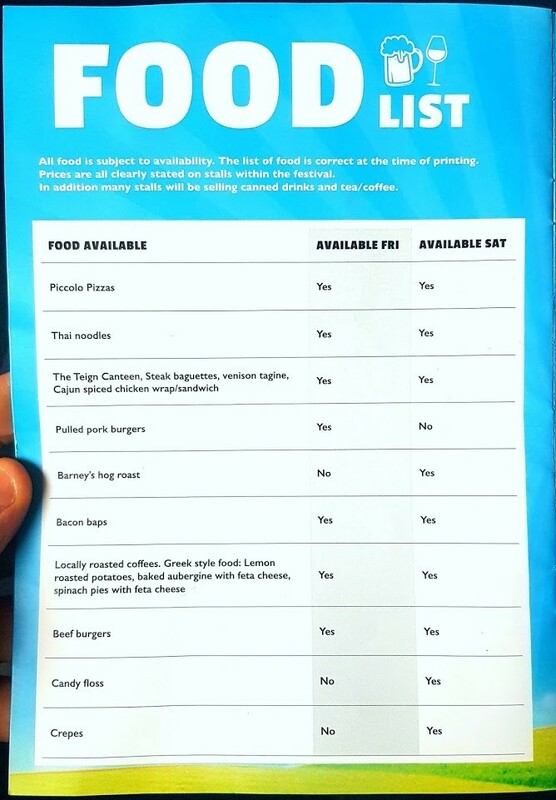 The food choice isn’t bad either with lots to choose from, but personally I usually go for the Piccolo Pizza. Get in quick though, they can easily have a half hour or more wait, especially at peek lunch or tea time. 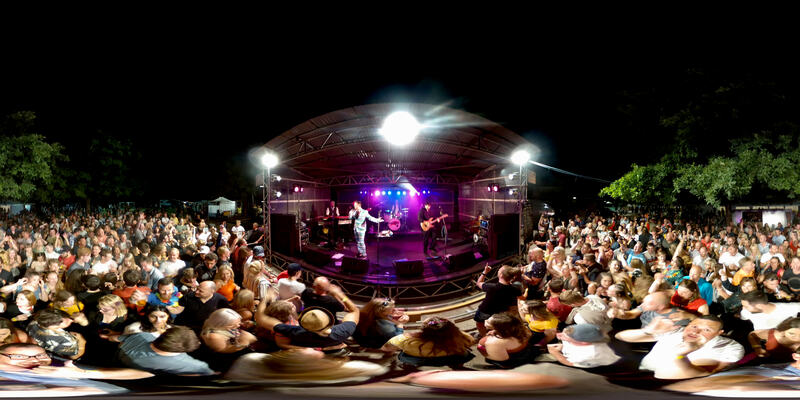 There are two stages for entertainment, the main stage and a smaller acoustic stage, usually alternating sets throughout the day. 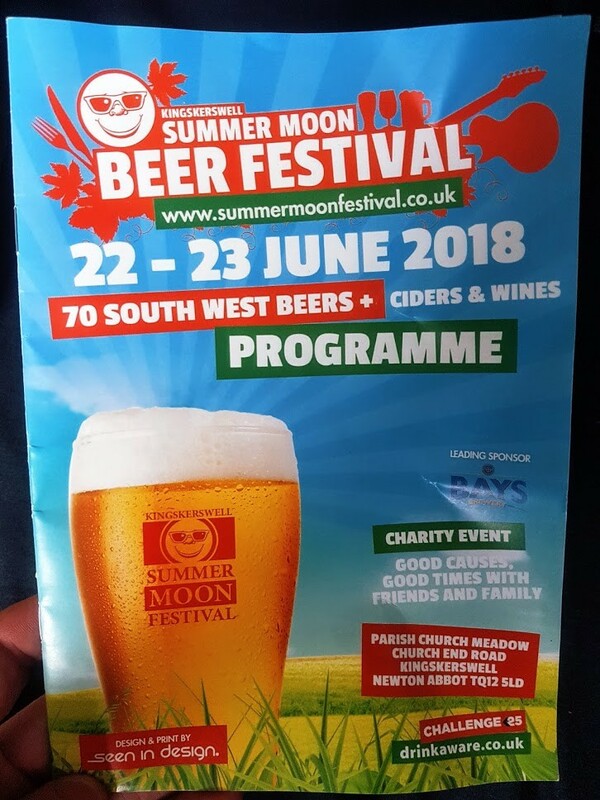 As I travel from Torbay I usually share a taxi with friends, but come the end of the event you’ll want to have pre booked as the wait can be over 30 minutes. Though we usually order a taxi to pick us up from the Nellie just up the road, so we can sit in the warm and have one more drink while we wait. 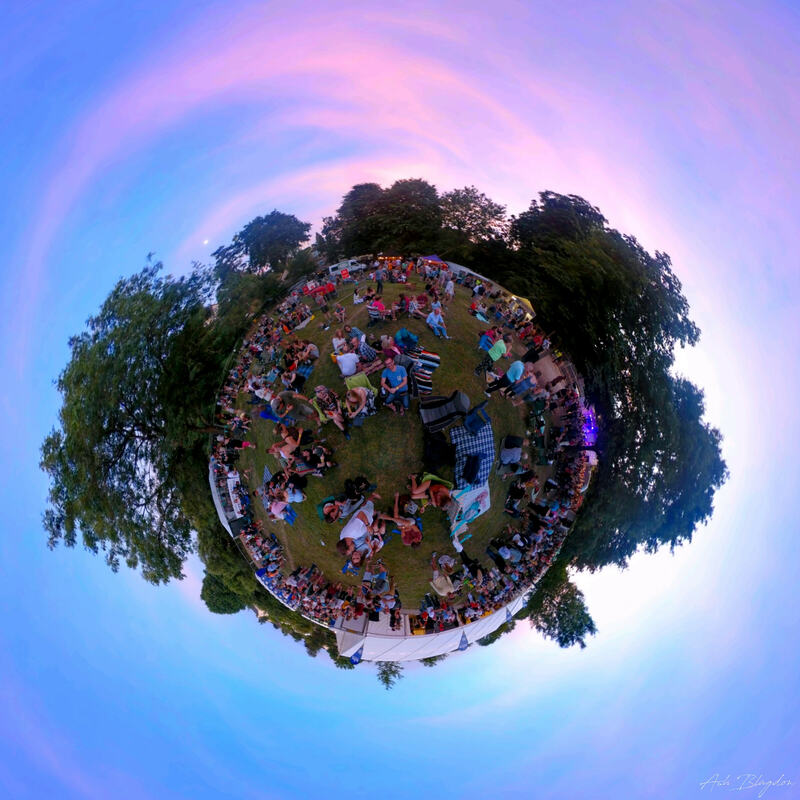 The First Summer Moon Festival was in 2008 and was founded by Vicar John Leonard. All profits raised from the event are donated to local charities and good causes. So far over the years they have raised over £115.000. 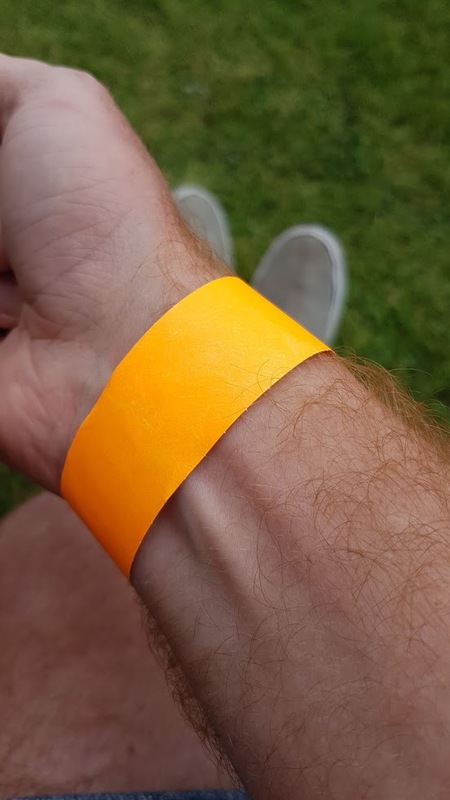 The Festival runs over two days, the bars operate on a token-only system. Thursday nights there is a ‘Night at the Proms’ concert, but no beer is drunk. The beers are served by volunteers from the local community. All tickets for the festival are sold on the gate. Cash only. Friday, (5pm-11pm), £6 per person (for all ages). Saturday, (11am-11pm), £10 per person (£5 for ages 12-15s Until 4pm – After 4pm : £10 for all ages). Music will play until 11pm. CAMRA members entry price : £7 (all day Saturday). This discounted price applies to CAMRA members on presentation of a valid membership card. Starter pack – 1 glass and 2 tokens. 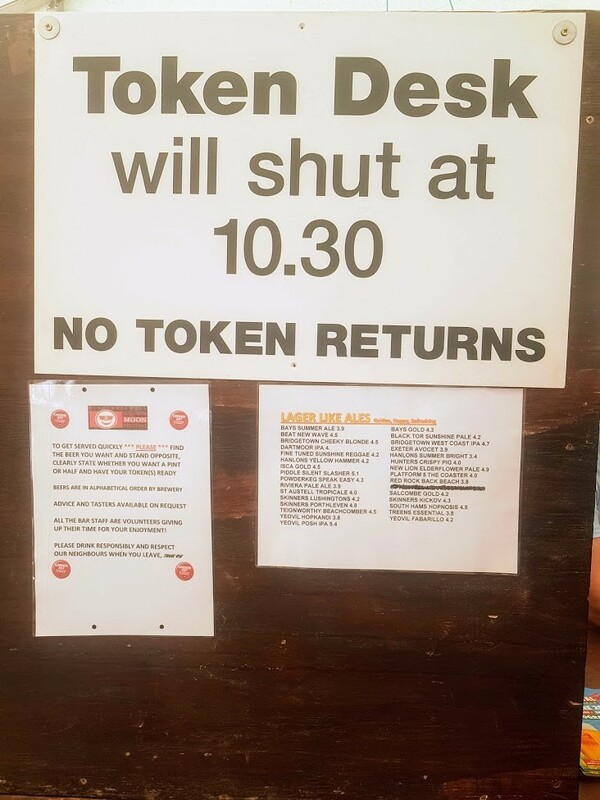 1 token = half pint of beer or cider. 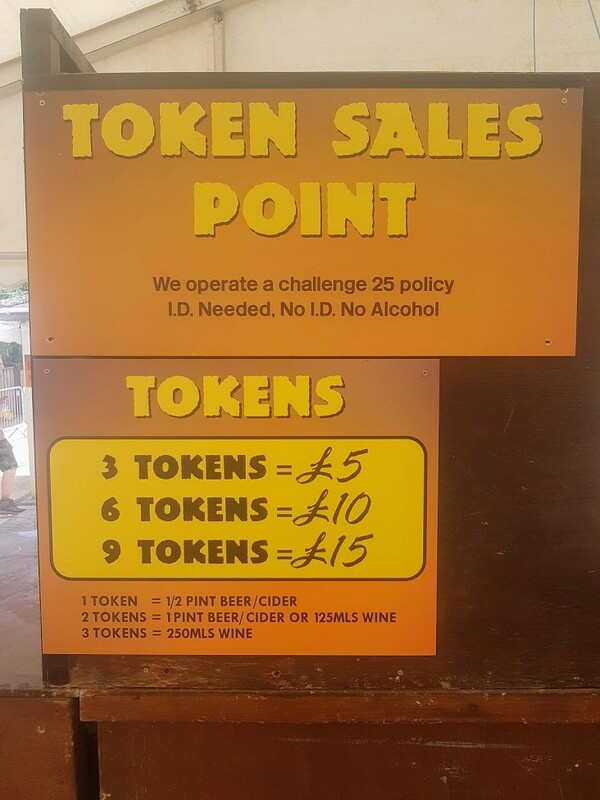 2 tokens = 1 pint of beer or cider or 125ml of wine. 3 Tokens = 250ml of wine or 200ml Prosecco. Replacement glasses = 1 token. 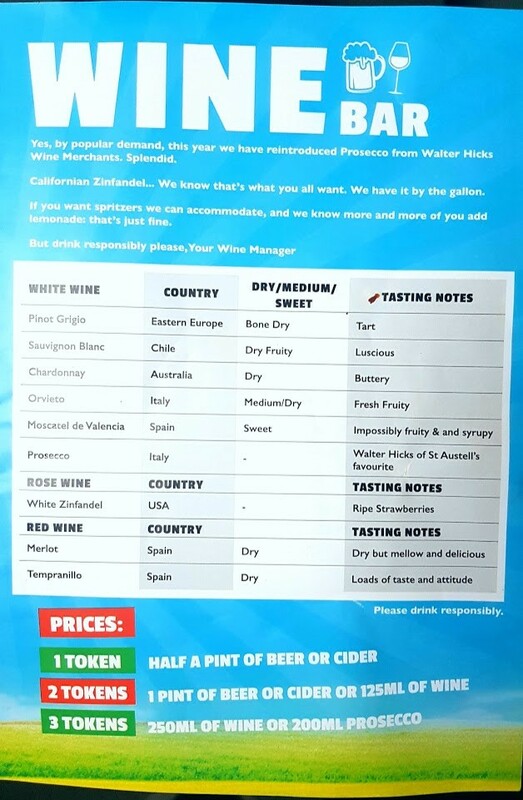 There are over 70 beers and for those seeking alternatives to real ales and cider, there is also a good selection of wine, plus prosecco. If you don’t spend all your tokens or find yourself driving you can buy a 2 or 4 pint carry out to take home with you. The Teign Canteen – Steak Baguettes, venison tagine, chicken wraps. There are two stages to keep everyone entertained Main Stage and Acoustic Stage with the music alternating, so they don’t clash. I’ve always shared a taxi, but there are a few options. There is no car parking available at the festival, so it’s best to use public transport, a taxi or ask someone to give you a lift. 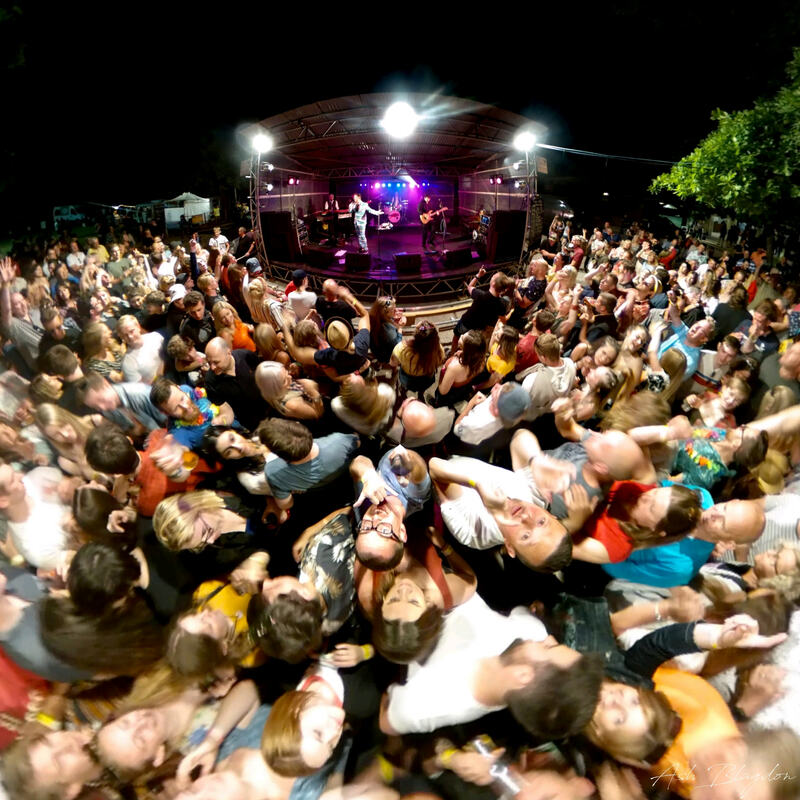 The postcode of the festival is TQ12 5LD. 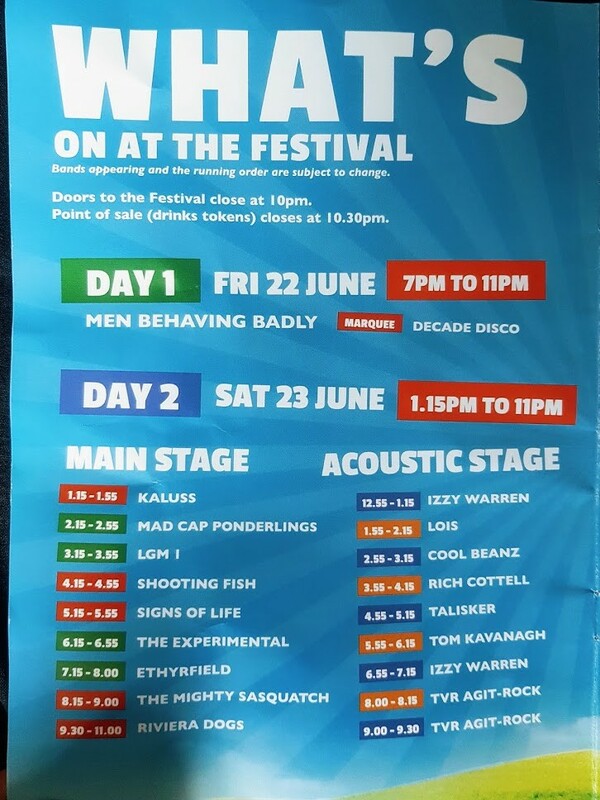 By Bus: The most convenient bus services for the festival are the No 12, X46 or No 66. At ‘Jury’s Corner’ (near the Sloop Hungry Horse pub). The event will be sign posted. It’s about 5-10 minute walk. By Train:The closest station is located at Newton Abbot. You’ll then have to jump on the No. 12 bus which stops directly outside the station. Then get off at the Sloop pub and walk following the sign posts. Take a foldable chair or picnic blanket to sit on. Always ask for a taster and don’t be afraid to try 3 or 4 before you settle on one. 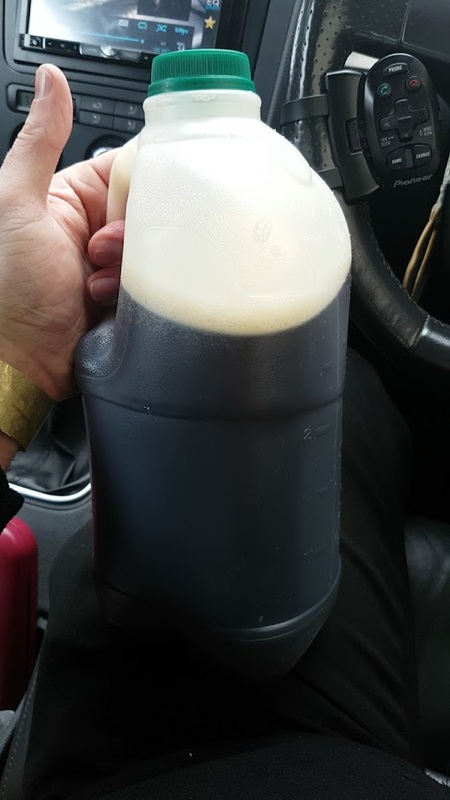 Never ask for a full pint, you can’t over fill a pint! You can take Unopened soft drinks and bottles of water. I recommend the pizza’s. Just don’t leave it till peak times as the queue will be huge! There is No cash machine at the festival. There is No car parking available at the festival. Don’t forget the suncream, if it’s a scorcher. Under 16’s must be accompanied by a parent/responsible adult. Challenge 25 will operate. After the event there can be a 1hr wait for a taxi. Walk to the Lord Nelson for a drink and get picked up from there. 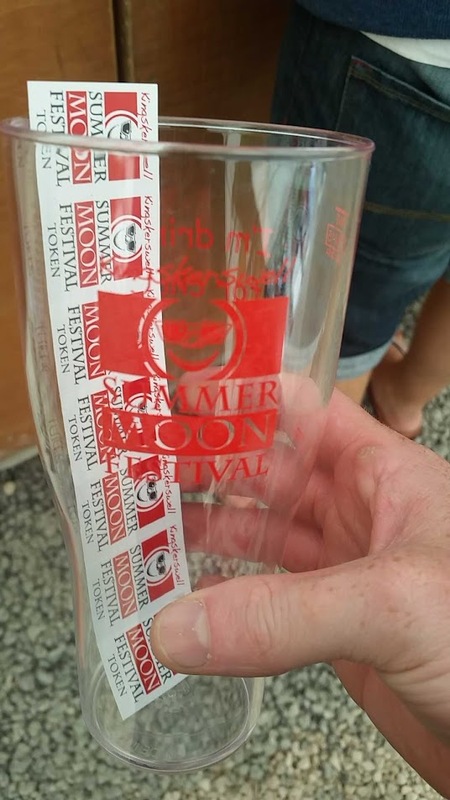 Have you been to the Summer Moon Beer Festival? Did you have a favourite beer or band? Did you try the pizza?